Now that the planning permit for "Manegg Mitte" has taken legal effect, the two development partners Baugenossenschaft des Eidgenössischen Personals (BEP) and Steiner AG have the green light to proceed with this project in the southern part of the city of Zurich. Over the next few years, 150 desirable owner-occupied apartments will be constructed in two buildings located right next to the River Sihl. They will be marketed under the name "Sihlterrassen". An additional building will house some 100 rental apartments for the BEP cooperative plus a number of attractive commercial units on the ground floor. Construction work is scheduled to start in 2019 and the first apartments are likely to be ready for occupation in 2021. Planning permission for the Manegg Mitte project, which has been granted by Zurich City Council, took legal effect at the end of August 2018. Peter Herzog, Team Leader of Real Estate Development at Steiner AG, is delighted: "With the granting of planning permission, we've reached another important milestone and can soon start on construction work at Manegg to realise this attractive complex." The site extends to almost 16,000 m2 overall, providing a total usable area of some 36,900 m2 distributed across the three new-builds. The total of 250 modern apartments in the three elegant buildings, ranging in size from 2.5 to 5.5 rooms, are aimed at families, couples, flat-sharers and single people in all age brackets. A few days ago, a marketing drive was launched to promote the owner-occupied apartments now branded as the "Sihlterrassen". Anyone interested in buying one of these properties will find detailed information about the range of apartments on offer, as well as about their excellent location, at www.sihlterrassen.ch. The website also features an online apartment configuration tool enabling prospective buyers to select the floor plan and fit-out scheme that suits them best. Manegg is one of the last big areas in the city of Zurich still undergoing development. The entry into force of the private Manegg master plan in 2011 mapped out the future of this former industrial site in the south of the city. As it is served by the S4 line of the Sihltal Zürich Uetliberg railway (SZU), the district enjoys excellent public transport links. Directly adjacent to the Greencity and Sihlbogen developments, it is an up-and-coming urban quarter located very close to the River Sihl in Zurich's southern suburb of Wollishofen. 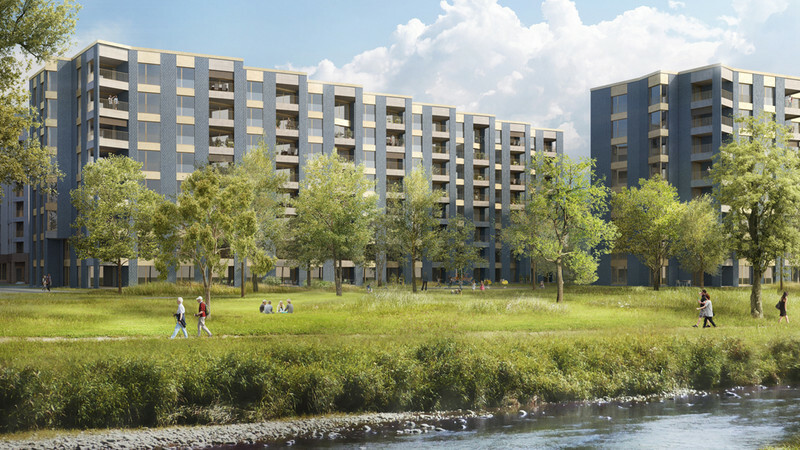 Now that the planning permit for "Manegg Mitte" has taken legal effect, the two development partners Baugenossenschaft des Eidgenössischen Personals (BEP) and Steiner AG have the green light to proceed with this project in the southern part of the city of Zurich.